Mushrooms and spinach are two of my favorite vegetables. They go so well in this creamy mushroom and spinach pasta. This is a healthy meal that doesn’t take very long to make at all. 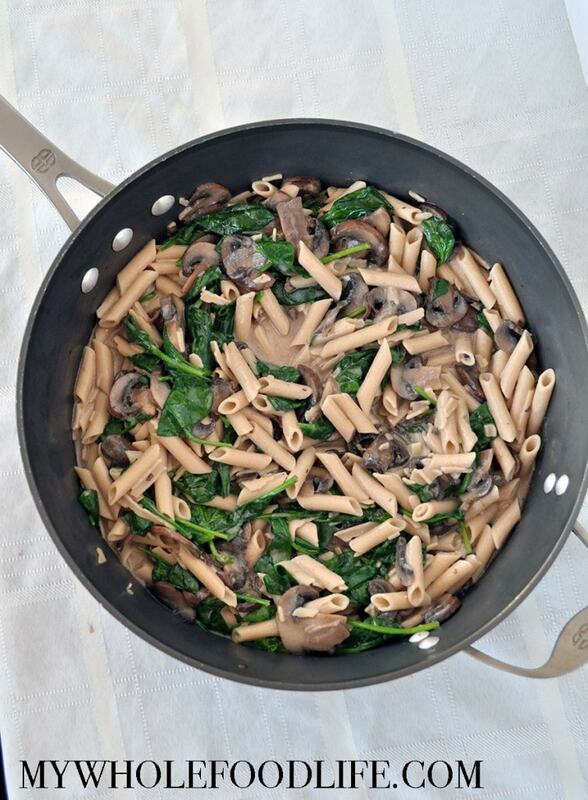 I used brown rice pasta in this creamy mushroom and spinach pasta to keep it gluten free. You can probably use regular pasta as well if you have no issues with gluten. 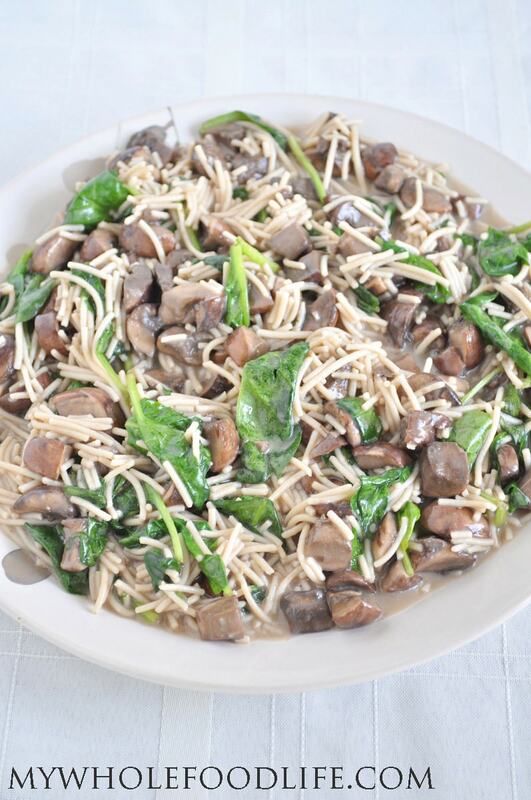 If you also enjoy spinach and mushrooms together, you may also like this recipe. I used full fat coconut milk in the can to give this pasta a creamy texture and taste. Not only does the coconut add to the taste, but the richness of it will keep you satisfied after only a small amount. This creamy mushroom and spinach pasta is more heavy on the vegetables than it is on the pasta. If you are grain free, you may also be able to make this dish with zucchini noodles. A healthy dinner ready in under 30 minutes! Cook spaghetti as per package instructions. Set aside. For sauce, add mushrooms, coconut milk, garlic, sea salt and cayenne in a saute pan . Cook on medium heat covered until mushrooms are soft, about 10 to 15 minutes. Turn heat to very low, uncover, and add spinach and spaghetti. Mix until the spinach had wilted and remove from heat. Ready to serve. This recipe should keep in the fridge for at least 4-5 days. Enjoy! I'm not sure if those will make a cream. Can you eat dairy? Heavy whipping cream will work as well. Would you use the same amount of heavy cream as coconut milk (13-14 oz)? YUM!!!! This was so delicious when I made it, but I'm at work now and had to log on to this site just to note how great this still tastes two days later. As any busy mom knows, meals that can be made ahead are gems, and I will definitely add this to my meal rotation! Awesome Nancy! So glad you liked it! Made this tonight and used zucchini noodles. Delightful! Glad you liked it! Good to know it works with the zoodles too. I'm so glad you liked it!! I need to try it with zoodles. Is one package of gluten free pasta equal to one pound of regular pasta? Thanks. Making this dish tonight. This was amazing! So simple, vegan, and tastes a lot better than expected... 10/10 thanks! You can make it with zucchini pasta using a spiralizer. I made the mistake of buying low fat coconut milk instead of full fat (fibro fog) but it was still delicious Can’t wait to make it with full fat coconut milk!